There are many people who are more comfortable with the idea of swimming in salt-water pools. You may wish to avoid eye or skin irritation in a traditional chlorinaton system, or you may just like the idea of an alternative. If you are sensitive to chlorine, salt-water swimming pools may suit your preferences in the family swimming pool. If you or your family would prefer a less reactive alternative to pool sanitation, install a salt-water system in your Landmark Swimming Pool. Many people are bothered by skin or eye irritation when swimming in chlorine treated pools. Generally, if the smell of chlorine is overwhelming, the water is not being maintained properly. Some people look into salt-water systems for their backyard pools thinking they can get away from chlorination. A salt-water swimming pool sanitation still relies on some chlorination, but the delivery system is very different. The salt in salt-water swimming pools does not affect buoyancy, nor does it disinfect your water from algaes, bacteria, mold and other organisms. In the traditionally chlorinated pool, pool water is maintained by adding either pure chlorine gas or by pouring chlorine compounds into the water. In a poorly maintained pool, unhealthy levels of chloramine compounds can build up and cause irritation. Salt-water pools use salt – sodium chloride – and electrolysis to continuously deliver disinfecting chlorine compounds without the irritating by-products that cause lung or eye irritation. A salt water system may significantly reduce the irritation some swimmers experience in chlorinated pools. 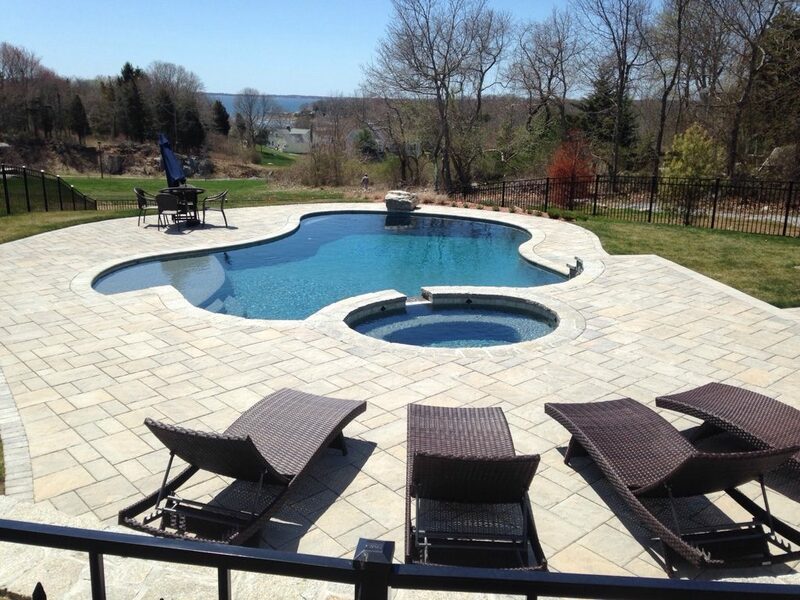 Landmark Swimming Pool Contractors are well known for our world-class gunite in-ground swimming pools, salt-water swimming pools and custom spas. Landmark Swimming Pools has been the leading builder of custom in-ground swimming pools in greater Hartford for three decades. A full-service swimming pool company, we also offer pool and spa maintenance and repair services. The swimming pool contractors at Landmark design and craft your custom pool to complement the topography of your property. Call for a consultation today (800) 545-1460.